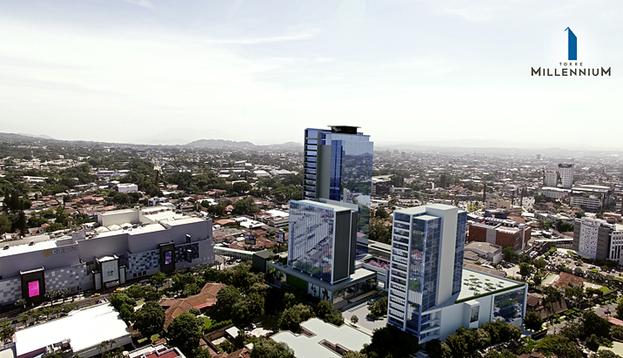 Slate Geotechnical Consultants completed a site response analysis to support the development of design acceleration response spectrum for the Millenium Plaza Development in San Salvador, El Salvador. The development consists of a mass excavation of six basement levels to a depth of about 22.6 meters (75 feet) below adjacent grades and the construction of three reinforced concrete buildings ranging between 10- to 30-stories. Slate reviewed existing subsurface data collected by others to develop a site-specific horizontal foundation input response spectrum using a combination of ASCE/SEI 7-16 and the generalized site response procedures adopted by the US Nuclear Regulatory Commission. Two deterministic scenario response spectra were developed for a high frequency, local event and a low frequency, subduction event. Site response analysis was evaluated by developing three soil profiles for a randomized one-dimensional site response analysis for both the local and subduction events using Random Vibration Theory (RVT). The analysis was performed with 30 randomized permutations of shear wave velocity and dynamic material properties for each of the three soil profiles. The randomization was performed to capture a range of peak responses that are associated with the uncertainty in the soil profiles, particularly the shear wave velocities. Based on the results of the analysis, Slate provided recommendations for site class that best represents the expected ground motions at the project site and a comparison of the code-based spectrum and the response spectrum developed from the site response analysis. The results of our analysis and recommendations provided the client and design team with seismic design criteria for the development.